WinZip® is the world's most popular file compression software with over 20 years experience as the leader in the file compression industry. No other file compression utility is as easy to use or offers such a comprehensive and innovative feature set to help you save time, conserve space, and improve productivity. WinZip 15.0 introduces new functionality that makes it even easier to compress files and decompress files, encrypt confidential information, share files swiftly and safely, and backup important data automatically. 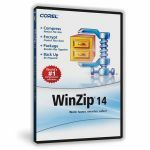 With a powerful new zip engine for increased zipping performance, a simplified interface, a groundbreaking desktop gadget, and enhanced file sharing capabilities, this release represents the very best in WinZip technology. With WinZip, you can instantly compress files to conserve storage space, send swifter emails, and decrease file upload/download times. Zip documents, spreadsheets, PDFs, presentations, you name it! WinZip 15 introduces a brand new zip engine that provides significant performance enhancements, giving additional power and agility to your file compression tasks! With easy tools and drag-and-drop functionality, WinZip helps you create compressed files in the following formats: Zip, LHA, and Zipx (our smallest Zip file to date). Not sure which format to use? Let WinZip select the best compression method to maximize efficiency! You can even create self-extracting Zip files, which are ideal for distribution to recipients who may not own WinZip. WinZip also provides advanced photo and image compression. With a single click, you can compress your digital photographs and graphic images by 20-25% with no loss of quality or data integrity. This lets you send files faster and fit more on your flash drive, CD/DVD, or hard disk. In addition to compressing files, WinZip instantly opens and extracts content from the industry's widest selection of compressed file types, including Zip, Zipx, RAR, 7Z, BZ2, LHA, CAB, IMG, ISO, and most other file archive formats. Along with state-of-the-art file compression and decompression, WinZip also offers strong AES encryption to help you secure sensitive data from unauthorized access. Encrypt and password-protect your files as you zip them, all in one easy step! You can even define your own password policies that WinZip will enforce for each file you encrypt. As an added security measure, WinZip also auto-wipes or "shreds" temporarily extracted copies of encrypted files using the U.S. Department of Defense standard (DoD 5220.22-M). This automatic action prevents protected files from being recovered and misused. Use WinZip to organize and compress your data into convenient, logical groups that are perfect for sharing! Smaller file sizes translate to faster uploading/downloading times and hassle-free email attachments that don't clog email servers. Using WinZip's powerful encryption capabilities, you can also password-protect compressed files to prevent third parties from gaining unwanted access to your data, making them ideal for sharing! 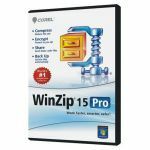 WinZip 15 includes convenient Zip and E-mail tools so that you can zip, encrypt, and email a file directly from the WinZip window without having to open any other applications. This allows you to work without interruption and share files swiftly, safely, and seamlessly! WinZip 15 provides extensive support for most email and webmail applications—once configured, you can zip and email files from virtually any email address! In addition, WinZip 15's Zip and E-mail function includes an image resizer that allows you to resize, zip, and email a set of images in one easy step! WinZip takes full advantage of its file compression technology with an automated data backup facility that helps you prevent data loss. Backup your desktop, documents, pictures, email, etc. using pre-defined jobs or by creating custom backup jobs using WinZip's simple wizard. You can set WinZip to backup selected data files, and you can schedule those backups to run automatically and unattended. You can also backup data to a CD/DVD or network drive, email your backups off site from virtually any email address, or upload your backups to an off-site server using the built-in WinZip FTP client. WinZip will even send you automated email notifications upon job completion!